The head of state is the President of Algeria, who is elected for a five-year term. The president was formerly limited to two five-year terms but a constitutional amendment passed by the Parliament on November 11, 2008 removed this limitation. 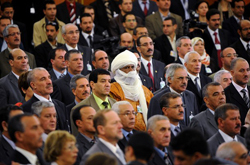 Algeria has universal suffrage at 18 years of age. The President is the head of the Council of Ministers and of the High Security Council. He appoints the Prime Minister who is also the head of government. The Prime Minister appoints the Council of Ministers. The military of Algeria consists of the People's National Army (ANP), the Algerian National Navy (MRA), and the Algerian Air Force (QJJ), plus the Territorial Air Defense Force. It is the direct successor of the Armée de Libération Nationale (ALN), the armed wing of the nationalist National Liberation Front, which fought French colonial occupation during the Algerian War of Independence (1954–62). The commander-in-chief of the military is the president, who is also Minister of National Defense. Total military personnel include 147,000 active, 150,000 reserve, and 187,000 paramilitary staff (2008 estimate). Service in the military is compulsory for men aged 19–30, for a total of eighteen months (six training and twelve in civil projects). The total military expenditure in 2006 was estimated variously at 2.7% of GDP (3,096 million), or 3.3% of GDP. Algeria is a leading military power in North Africa and has its force oriented toward its western (Morocco) and eastern (Libya) borders. Its primary military supplier has been the former Soviet Union, which has sold various types of sophisticated equipment under military trade agreements, and the People's Republic of China. Algeria has attempted, in recent years, to diversify its sources of military material. Military forces are supplemented by a 70,000-member gendarmerie or rural police force under the control of the president and 30,000-member Sûreté nationale or metropolitan police force under the Ministry of the Interior. In 2007, the Algerian Air Force signed a deal with Russia to purchase 49 MiG-29SMT and 6 MiG-29UBT at an estimated $1.9 billion. They also agreed to return old aircraft purchased from the Former USSR. Russia is also building two 636-type diesel submarines for Algeria. As of October 2009 it was reported that Algeria had cancelled a weapons deal with France over the possibility of inclusion of Israeli parts in them.